Although I wrote everything I know about squirrel issues for this website, oftentimes a problem with squirrels in the attic is beyond the scope of the do-it-yourself homeowner to solve. I have found a professional company in Hartford, Connecticut that handles problems with wildlife. 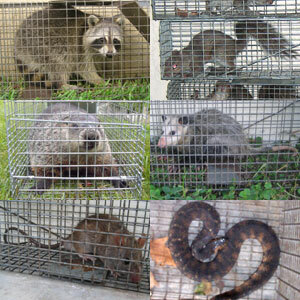 Catseye Pest Control has access to tools, techniques, and experience that help them do a far better job at wildlife removal than a non-experienced homeowner could. They possess licensing that allows them to do certain types of work legally, that non-licensed homeowners in the state of Connecticut are not allowed to do. For the welfare of your situation, and the squirrels, in some cases it's best to hire a pro. There are good companies and bad companies out there. I've done research on such companies, to get to know them, and feel confident recommending their services. I therefore recommend a company called Catseye Pest Control which services Hartford, Connecticut. If you have a squirrel problem, or any other conflict with a wild animal, and live in Hartford, I am confident that this company, Catseye Pest Control, is the one to call. I asked the company to describe their service range, and they said this - Our main area of operation for most nuisance animal work is the Hartford area. including the farmington Valley Region and the towns of Granby, Simsbury, Canton, Bloomfield and Avon. Catseye Pest Control operates 24/7, so don't hesitate to call at any time to discuss your wildlife problem, and schedule an appointment for same-day or next-day service. I think we have a raccoon or squirrel I was reading over your page but it didn't indicate that squirrels make a large thumping noise and whatever is up in the attic it may come watch something always wear in I think someone human it in my home. The noise is very loud and alarming very scary it wakes me up out of my sleep during the day tried calling 2 different companies but to no avail do you have any recommendations for Fayette County area in Georgia. Hi I recently had my roof holes repaired with metal plates and the tree branches so far away from my house. But I find the squirrels still climbing up/down the water gutter. I witness one climbing down. Sounds as if they running through the roof gutters until I bang on the wall. How do I get rid of them FOREVER! This message is not for the website post and I appreciate your cooperation thank you. If you have a squirrel problem in Hartford County Connecticut, or any other conflict with a wild animal, I am confident that we can solve it. We use humane methods when dealing with Hartford wildlife removal situations. Squirrel Control Hartford. Our company is fully licensed and insured in Connecticut. Call us any time at 860-422-4752 for a price quote and to schedule a same-day or next-day appointment to solve your squirrel problem in Hartford.